Calif Fires Summer 2009 – Part 2: We Are Watching YOU! 834 personnel, an additional 85 crew since the last blog entry, pushed back by the flames, fighting hard to boost the containment to 94%. Then came the really bad/good news: Sanat Ana winds were picking up! A Red Flag Warning will be in effect through Wednesday evening for winds gusting to 35 mph and a relative humidity below 15%. Weak to light Santa Ana winds are predicted for late tonight. Santa Ana winds are dry and warm (often hot) winds in the Southern California area that blow in from the desert. Due to this anticipated increase in temperatures, wind, and a decrease in humidity over the next few days additional aircraft were ordered which include 4 Type 1 heavy helitankers. Helicopters began the aerial assault on Saturday and will continue through the week needed. The intent is to extinguish remaining interior hotspots and reduce the risk of embers igniting additional fuels during the anticipated hot, dry and windy weather. These hotspots are located in steep and rugged terrain, which is inaccessible by ground crews. Three airtankers will also used today to strengthen control lines in anticipation of theses hot, dry and windy conditions. InciWeb said. Naturally, the estimated containment date has been pushed back again to Thursday September 24th, 2009 approx 12:00 AM. Something tells me the date would be changed again! When you’re in love with something, it’s hard to let go! A reduced number of 749 personnel “continue to hold and mop up the 132 miles of containment line around the fire,” InciWeb reported. Station fire is now 93% contained, with the estimated containment date now pushed back to September 22, 2009. Videos of the Station Fire can be seen at Station Fire Videos. As for the cost of Station Fire, FEWW’s earlier estimate of $100million may have to be revised. The Moderate Resolution Imaging Spectroradiometer (MODIS) on NASA’s Aqua satellite captured this false-color image of the Station Fire and its surroundings on September 16, 2009. Using a combination of infrared and visible light to increase the contrast between burned land, and vegetated or bare land, this image shows the scar from the Station Fire, an irregular patch of brownish red. Vegetation—even sparse vegetation— appears bright green. North of the fire, the Mojave Desert appears sandy pink. South of the fire, the sprawling metropolis of Los Angeles appears in shades of blue-gray to nearly white. NASA image by Jeff Schmaltz, MODIS Rapid Response Team. Caption by Michon Scott. Was erased due to a s/w problem; the system failed to automatically back up the content. The estimated containment date has been pushed back until Saturday, September 19th, 2009 approx 06:00 PM. Currently 1,192 personnel are working on the fire which has burned a total of 160,557 acres (650 km² or 251 square miles), or an area nearly 4 times the size of District of Columbia. No further information is available concerning the arsonists who started this diabolic fire. FEWW is watching with interest how the next large/major fire might start in SoCal, or indeed elsewhere in the country. “There are still acts that go above and beyond duty,” Vice President Joe Biden told the audience as Secret Service agents stood on the top steps of the dugouts and scanned the crowd. “Two men tell others to hunker down and race out to find a way out — it is above and beyond the call of duty. That’s real courage.” —LA Times. “You are giants in my eyes and in the eyes of all Californians.” Gov. Arnold Schwarzenegger said. The authorities said the fire was 84% contained; they have reduced the number of fire crew to 1,824, InciWeb reported. Estimated containment date is reported as Tuesday, September 15th, 2009 approx 06:00 PM. The cost of fire, as FEWW estimated last week could/would reach/exceed $100million. The last of the burn operation can be seen on the Mt. Wilson Camera. Thank God Rudy Giuliani is no longer in charge of the fire crew! Pharmaceuticals and Fire Industry share two common features. Fire crews reported significant progress in tackling the Station fire, which has now burned more than 160,000 acres (650km²). They have contained 71% of the blaze. “By late afternoon, ground crews had completed their work in setting controlled fires. Helicopter crews were set to begin their work later today to focus on inaccessible forestland, said Loretta Benavidez, a spokeswoman for the U.S. Forest Service.” LA times reported. The controlled burn could only moves in the desired direction if the wind and weather conditions are optimal, the report said. Meanwhile, a U.S. Forest Service administrator revealed that four of their fire crew, and one of their other employees, had “lost everything” in the fire. 2. The activities of both industries are very predictable! Californians should thank the deities the Fire Industry is NOT [yet] in the business of selling amputations as cure for gangrene! The scheduled burnout operation east of Mt. Wilson were delayed due to unfavorable wind conditions which has hampered fire crews efforts, LA Times reported. Station fire, the largest fire in Los Angeles County’s modern history (so far) has to date blackened about 160,400 acres and destroyed about 80 residences. The blaze is 62% contained, officials said. “We as Californians understand the incalculable damages that can be caused by wildfire, which makes it all the more essential that we do everything possible to prevent unnecessary and senseless disaster at the hand of an arsonist,’’ LA Times reported Rep. Mary Bono Mack (R-Palm Springs) as saying. Between them, the Los Angeles County Board of Supervisors and the state of California, are offering a total rewards of $150,000 for information leading to the conviction of the arsonists. “Sheriff’s homicide detectives searching for the arsonist who set the deadly Station fire are appealing for anyone who travelled on the Angeles Crest Highway just above La Cañada Flintridge around 3:30 p.m. on August 25.” LA Times reported. “Obviously if someone saw something that day we would like them to come forward and speak to investigators. But even if they didn’t see anything we would also like them to contact detectives if they traveled past there around that time,” said Steve Whitmore, sheriff’s spokesman. What part of what FEWW said about the Fire Industry being the Arsonists you don’t understand? Meanwhile, Station fire, which has consumed more than 160,000 acres (649 km²/ 251 sq miles) in 15 days, is now 56% contained, however, the winds are picking up again, causing concern for the fire crews. Oasis (Sonoma-Lake Napa Unit, Cal Fire), 400 acres at 15 percent contained. This fire is five miles southwest of Wilber Springs, NIFC reporetd. The Station fire grew to more than 636 km² (246 sq miles) earlier this morning, joining California’s list of 10th-largest fires ever recorded, officials said. Big Meadow (Yosemite National Park): 7,425 acres at 96 100 percent contained. This fire is two miles northeast of El Portal. (Cost to date: NOT disclosed; estimated at $20 million). Cooler temperatures and higher humidity helped the fire crews increase their containment of Station Fire (aka Corporate Arson) to nearly 50%. The 623-km² blaze is largest in LA County history so far. Fire authorities say the blaze, which has so far cost about $40 million to tackle, would be fully contained by Sept. 15. A source told The Times that “material that didn’t belong there” has been found at the site suspected to be where the fire started, a twice-scorched slope cordoned off by crime scene tape near Mile Marker 29 along Angeles Crest Highway. … it was found in the brush off the highway, within walking distance of the turnoff at the center of the arson probe. Red Rock (Klamath National Forest): 1,364 acres at 95 percent contained. This fire is 15 miles west of Fort Jones. Minimal fire activity was reported. Station fire is now 42 % contained, fire authorities said. Oak Glen 3 (San Bernardino Unit, Cal Fire): 1,159 acres at 90 percent contained. This fire is four miles north of San Bernardino. Some 4,735 fire crew have contained about 38 % of the Station Fire, estimated at 144,743 acres. Oak Glen 3 (San Bernardino Unit, Cal Fire): 1,159 acres at 75 percent contained. This fire is four miles north of San Bernardino. Minimal fire activity was reported. Morris (Angeles National Forest): 2,168 acres at 95 percent contained. This fire is five miles north of Azusa. Big Meadow (Yosemite National Park): 6,283 acres at 60 percent contained. This fire is two miles northeast of El Portal. Structures remain threatened and roads are closed. Precipitation fell on the fire yesterday. Pendleton (San Bernardino Unit, Cal Fire): 860 acres at 95 percent contained. This fire is burning two miles east of Yucaipa. Fire activity was minimal. Red Rock (Klamath National Forest): 1,382 acres at 90 percent contained. This fire is 15 miles west of Fort Jones. Minimal fire activity was reported. A rise of more than 45 folds! There are currently 6 large fires burning in SoCal, the largest and most dangerous of which is the Station Fire. Station Fire Approx. Location Map [as of September 2, 2009 at 5:10 PM PDT] . Source of initial image: Google. Image may be subject to copyright. The Station Fire is now at 140,150 acres. The fire continues to burn within the Angeles National Forest and near surrounding foothill communities of La Canada-Flintridge, La Crescenta, Acton, Soledad Canyon, Pasadena and Glendale. Steep terrain, decadent old growth brush and hot dry weather are factors that drive fire activity. Evacuations, a forest closure order and temporary flight restrictions remain in effect. A second fire camp has been set up in Santa Clarita to help support fire fighting efforts. Evacuations and fire conditions on the fire are constantly changing. Be sure to check for changes in evacuations by dialing 211. Summary: The Station Fire has burned 218 square miles of land within the Angeles National Forest and near surrounding foothill communities of La Canada Flintridge, La Crescenta, Acton, Soledad Canyon, Pasadena and Glendale. The goals of the firefighters are to keep the fire west of Highway 39 and Angeles Crest Highway, east of Interstate 5, south of Highway 14, Pear Blossom Highway, and Highway 138, and north of the foothill communities and the Angeles National Forest Boundary. Angeles Crest Highway remains closed and is the primary access route for camps , numerous private residences, and the Mount Wilson Communication Facility and Observatory. Multiple evacuation centers have been established. The Mount Wilson Communications is directly threatened. This facility is a major communications hub for all of Southern California. Full containment is expected September 7, 2009. Full containment expected September 4, 2009. The Station fire now covers about 140,000 acres (about 570 square km), however fire officials say they have made progress and believe they could save Mt. Wilson observatory, and the all-important TV and radio transmission towers, at least for now! Temperatures continue to drop with humidity rising ( thanks to a small extent, perhaps, to hurricabe Jimena drenching the California Baja Peninsula). No. of properties destroyed: at least 62 homes. Water and gel drops deposited from aircraft and sprayed by fire engines are dripping from everything that still stands in the area. The fire is about 22% contained and about 10,000 homes are still threatened. The eastern flank of the station fire is creeping in the mountains north of Altadena and Pasadena, officials said. Evacuation orders have been lifted in La Cañada Flintridge, La Crescenta and other communities in the region. But that’s all the water we’ve got! Photo: From a lakeside dock in Yucaipa Regional Park, the McHenry family cheers as a Sikorsky S64 Sky Crane firefighting helicopter goes “In the Dip” for another load of water Tuesday. (Don Bartletti /Los Angeles Times). Image may be subject to copyright. Fire crews are reportedly trying to save the historic Mt Wilson observatory as well as important TV and radio antennas from destruction. Fire was approaching the mountain from two directions: about 800 meters (yards) to the north and 1,200 meters (yards) to the west. Photo: Flames from the Station fire approach Mt. Wilson Observatory in the Angeles National Forest. (Genaro Molina/Los Angeles Times). Image may be subject to copyright. Smoke from the Station Fire rises over downtown Los Angeles Monday, Aug. 31, 2009. (AP Photo/Jon Vidar). Image may be subject to copyright. The Los Angeles skyline is obscured by smoke [buildings are barely visible in the background] from the Station Fire north of the city August 31, 2009. A deadly wildfire burning out of control for a sixth day in the parched mountains north of Los Angeles doubled in size overnight on Monday and posed a continuing threat to Mount Wilson, a key communications nexus for the region’s broadcasters and emergency services. REUTERS/Freds Prouser. Image may be subject to copyright. The Station fire, currently the largest of eight blazes blackening southern California, “was plowing through dense hillside vegetation and steep terrain toward residential areas of Sunland and Santa Clarita on the west.” LA Times reported. A new fire in San Bernardino County is growing completely out of control and threatening about 2,000 homes near Yucaipa, a city located about 15 km east of San Bernardino, with a population of 50,000. The Station Fire has more than doubled in size to about 110,000 acres burning completely out of control for a sixth day. Two fire crews were killed Sunday when they drove off the side of a road in the Mt. Gleason area, south of Acton. About 2,600 personnel are currently tackling the massive blaze. Fire destroyed 18 homes Sunday and at least three structures early Monday, according to California Department of Forestry and Fire Protection. Two school districts canceled the first day of classes due to heavy smoke, which made breathing difficult. LA Times Google Map of the Station Fire. Image may be subject to copyright. The areas shaded in yellow are (L-R) Acton/Agua Dulce area (evacuated), Cheseboro Road south of Mt Emma Road (evacuated), Juniper Hills neighborhood (under evacuation orders). Towering Inferno. A structure burns during the Station Fire in the Big Tujunga canyon area of Los Angeles, California August 29, 2009. REUTERS/Gene Blevins. Image may be subject to copyright. Smoke from the Station fire over the Angeles National Forest as seen from a hellicopter. (Mel Melcon/Los Angeles Times /August 31, 2009). Image may be subject to copyright. South of Dixieline? Flames burn near a cross during the Station Fire in the Big Tujunga area of Los Angeles, California August 29, 2009. REUTERS/Gene Blevins. Image may be subject to copyright. What da fiia ma gonna do now? A deer walks through charred forest in the Angeles National Forest near Acton. (Justin Sullivan/Getty Images /August 31, 2009). Image may be subject to copyright. Station Fire killed 2 fire crews as it blackened nearly 43,000 acres of forest and scrubland, destroying 18 homes. Station Fire images are reminiscent of Vietnam War. Original caption: A helicopter finishes a water drop and flies over the setting sun over the town of Acton. Photo: Genaro Molina / Los Angeles Times / August 30, 2009. Image may be subject to copyright. The Station fire, characterized as “treacherous” by U.S. Forest Service Incident Chief the has now burned more than 35,000 acres of land, destroying another handful of homes. About 6,600 homes across the 32-km fire line were reportedly under mandatory evacuation as a DC-10 and other aircraft doused the area with hundreds of tons of water and orange-colored flame retardant. According to Gov Schwarzenegger, 12,500 structures are under threat, with 2,200 personnel tackling the fire, which is 5 percent contained. DC-10 douses the Station fire and surrounding area with fire retardant. This picture was taken from Soledad Canyon Road in Acton. Credit: Irfan Khan / Los Angeles Times. Image may be subject to copyright. Calif Fires Beat Clunker Boost Any Day! The Station Fire started off Angeles Crest Highway (SR 2) about one mile above Angeles Crest Fire Station around 3:30pm Wednesday August 26, 2009. Angeles Crest Highway, Tujunga Canyon and Big Tujunga Canyon roads are closed. As a result of extreme fire activity, and to protect public health and safety, Angeles National Forest officials implementing an area closure for lands in the vicinity of the fire. This closure is in effect until canceled. 3 injuries have been reported. Residents are advised to be ready to evacuate if they are near the fire boundary. As of 8:00 p.m. Saturday evening the fire is moving very quickly to the north towards Acton. If the fire continues on this aggressive path it could be very near Acton by early morning. Station Fire: Location Map. Google Map may be subject to copyright. Flames from the Station Fire are seen above the NASA’s Jet Propulsion Laboratory, in La Canada, California August 28, 2009. REUTERS/Rod Seward. Image may be subject to copyright. Fuels Involved: Very heavy fuels of ceanothus, chamise, scrub oak and manzanita across the entire fire area, 15 to 20 feet in height with Big Cone Douglas Fir in the drainage bottoms. Fuels have not experienced any significant large fire activity in the past 40 years. Fire Behavior: The fire quadrupled in size driven by SE winds. Saturday behavior was extremely active with rapid rates of spread and flame lengths up to 80 feet. There is a potential for Sunday’s fire behavior to be similar to Saturday. Upslope winds are likely. Spotting may occur from 1/4 mile up to 1/2 mile. Significant Events: Mandatory Evacuations are in effect for over 10,000 homes. The fire is threatening the Mount Wilson Communications Facilities and Observatory. The Station fire in the Angeles National Forest has tripled in size today, spreading rapidly to the east and west this afternoon, and prompting the evacuation of at least 4,000 homes in a broad swath of foothill neighborhoods in areas including La Cañada Flintridge, Glendale, Altadena and Big Tujunga Canyon as temperatures reached triple digits and flames drew closer to houses. Photo credit: Genaro Molina / Los Angeles Times. Caption: LA Times. Threatened: There are approximately 100 homes threatened by the fire. Evacuations: All evacuations have been lifted on Highway 146, Bryant Canyon and Stonewall Road. As brush fires consumed more than 12,000 acres in Los Angeles and Monterey counties, an aircraft dropped water and the dreaded orange retardant on the steep terrain along La Canada Flintridge, while some residents stayed behind to protect their multimillion-dollar homes. California Governor Arnold Schwarzenegger declared a state of emergency for the two counties, while some 1,000 residents from the coastal development of of Rancho Palos Verdes, who were under compulsory evacuation order, were allowed to return home. “We were very fortunate that the head of the fire … was stopped at the backyards of those homes,” said Los Angeles County deputy fire chief John Tripp. There are currently four major fires in the two counties, with containment near zero percent. Flames from the Station Fire are seen above La Canada, California August 27, 2009. Photo: REUTERS/Rod Seward. Image may be subject to copyright. Morris (Angeles National Forest): 2,000 acres at 60 percent contained. [2,168 acres – 85% contained.] This fire is five miles north of Azusa. Residences are threatened. Information: Call 626-574-5208 or visit the incident website. Big Meadow (Yosemite National Park): 1,700 acres at zero percent contained. [3,417 acres – 10% contained] This fire is two miles northeast of El Portal. Roads are closed and residences were evacuated. NEW Station (Angeles National Forest): 500 acres at zero percent contained. [5,500 acres, 5 percent contained ] This fire is four miles north of La Canada. Roads closures and evacuations are in effect. NEW Bryson (San Benito-Monterey Unit, Cal Fire): 4,000 acres at 80 percent contained. This fire is 20 miles southwest of King City. Firefighters expect to contain the fire tomorrow. NEW Gloria (San Benito-Monterey Unit, Cal Fire): 2,000 acres at zero percent contained. [6,000 acres, 15 percent contained.] This fire is four miles east Gonzales. Residences are threatened and evacuated. Highway 146 is closed. Red Rock (Klamath National Forest): 1,277 1,355 cres at 75 percent contained. This fire is 15 miles west of Fort Jones. Structures remain threatened. Harrington (Klamath National Forest): 165 acres at an unknown percent contained. This previously reported fire is 20 miles southwest of Happy Camp. Minimal fire activity was reported. NEW Day (Lassen-Modoc Unit, Cal Fire):250 acres at 10 percent contained. [853 acres – 50% contained.] This fire is five miles northeast of Pittville. Active fire behavior was reported. Residences are threatened. Lockheed fire in Santa Cruz County, which broke out August 12, is almost fully contained after blackening about 8,000 acres of land and damaging four seasonal cabins, according to the state fire officials. The fire [safely] spread through steep terrain, costing an estimated $25.5 million to date. Ten injuries since Aug. 12. Thirteen structures destroyed, one damaged. About 2,500 people were evacuated from their homes in the Bonny Doon, Swanton and Davenport communities. The Yuba Fire is almost entirely contained having consumed about 4,000 acres in the Dobbins area since August 14, destroying two homes. The cost: $10.7 million through Saturday. Los Angeles County-Ventura County. Meanwhile, a brush fire, which is believed to have started after a vehicle collision at about 2:00PM, burned eight acres near the Los Angeles County-Ventura County border, before it was contained by 122 Los Angeles firefighters, various media reported. The Fire industry can’t believe their luck! Mexican drug traffickers are suspected of starting fires near Santa Barbara. Photo: AFP. Image may be subject to copyright. Images of California Fire Retardant Nightmare! One day soon, California would be all retardant orange, red and fire! An aerial tanker drops a load of retardant on the northern flank of a fire near Castaic, Calif. Photo: Mark Boster/Los Angeles Times. Image may be subject to copyright. Another aerial tanker, too, drops its load of retardant on fire near Castaic. Photo: Mark Boster/Los Angeles Times. Image may be subject to copyright. For regularly updated California bushfire news click here. At least 11 major fires are now burning throughout Calif. Mandatory evacuations are underway at Swanton and Bonny Doon communities. About a 1,000 homes are threatened but no damage reported as yet. Lockheed fire is now 50 percent contained. Fire in Yuba County, north of Sacramento, has tripled in size to about 16 square km (6 square miles). Yuba fire has jumped the Yuba River and is burning into Nevada County. The fire is less than 15 percent contained. Lockheed (San Mateo-Santa Cruz Unit, Cal Fire): 6,843 acres at 40 percent contained. This fire is four miles northwest of Boulder. Evacuations remain for the communities of Bonny Doon and Swanton affecting 2,000-2,400 people. Information: Call (831) 335-6717 or visit the incident web site. Corral (Santa-Clara Unit, Cal Fire): 15,000 acres at 60 percent contained. This fire is 18 miles east of Pleasanton. Active fire behavior was reported. Information: Call (408) 779-0930 or visit the incident web site. Yuba (Nevada-Yuba Placer Unit, Cal Fire): 2,000 acres at 15 percent contained. This fire is three miles northeast of Dobbins. Evacuations are in place for Lake Francis Road, Yuba-Nevada Road, Colton Way, Candlewood, Rices Texas Hill, Rices Crossing (south end). Nearly 250 homes are threatened. Information: Call (530) 823-4083 or visit the incident web site. SHU Lightning (Shasta-Trinity Unit, Cal Fire): 17,623 acres at 85 percent contained. This fire is located three miles northeast of Burney. Information: Call 530-225-2510 or visit the incident web site. La Brea (Los Padres National Forest): 84,150 acres at 25 percent contained. This fire is one mile east of Santa Maria. Structures are threatened and evacuations are in effect. Information: Call 805-961-5770 or visit the incident web site. Stuff mothers should teach their children! After a week long investigation by the U.S. Forest Service Special Agents, the Santa Barbara County Sheriff’s Office and fire investigators it has been have revealed that the La Brea Fire was started by a cooking fire at a marijuana drug trafficking operation. The La Brea Fire Tip Line is still open, and anyone with additional information helpful to this ongoing investigation is urged to contact 805-686-5074. Initial attack activity (!) remained light yesterday with 121 new starts. Three new large fires were reported, one each in California, Utah, and Washington. Firefighters continue to battle the large fires throughout California, where residents from several communities have been evacuated. The Summit fire in California and the Horse Butte fire in Idaho were contained yesterday. Breezy and dry with offshore winds of 15-25 mph across Northern California. Drier with 15-30 mph winds across the Southwest and much of the Great Basin into the Central Rockies. Cloudy and cool across the Northern Rockies. Continued cool with showers across Alaska. Gradual drying across the Pacific Northwest. Railbelt Complex (Fairbanks Area, Alaska Department of Forestry): 636,224 acres at an unknown percent contained. This complex of three fires is 12 miles southwest of Nenana. The fire received rain yesterday. Information: Call 907-832-1835, 907-832-1097 or visit the incident web site. Crazy Mountain Complex (Upper Yukon Zone, Bureau of Land Management): 447,420 acres at an unknown percent contained. This complex of four fires is three miles southwest of Circle. The fire received rain yesterday. Information: Call 907-773-5511 or visit the incident web site. Rock Slough (Upper Yukon Zone, Bureau of Land Management): 61,467 acres at an unknown percent contained. This fire is 47 miles northeast of Fort Yukon. No new information was provided. This will be the last report unless new information is received. Hardluck Creek (Fairbanks Area, Department of Forestry): 12,834 acres at 50 percent contained. This fire is 27 miles northwest of Fairbanks. Residences are threatened. Information: Call 907-356-5511 or visit the incident web site. Woodchute (Prescott National Forest): 790 acres at 95 percent contained. This fire is 14 miles northeast of Prescott. Fire activity was minimal. Pipeline (Kaibab National Forest): 1,025 acres at an unknown percent contained. This previously reported confine/contain fire is 20 miles south of Fredonia. This will be the last report unless significant activity occurs. Lockheed (San Mateo-Santa Cruz Unit, Cal Fire): 5,036 acres at 15 percent contained. This fire is four miles northwest of Boulder. Evacuations remain for the communities of Bonny Doon and Swanton affecting 2,000-2,400 people. Corral (Santa-Clara Unit, Cal Fire): 15,000 acres at 20 percent contained. This fire is 18 miles east of Pleasanton. Active fire behavior was reported. NEW Yuba (Nevada-Yuba Placer Unit, Cal Fire): 1,000 acres at zero percent contained. This fire is three miles northeast of Dobbins. A powerhouse, transmission lines, and the communities of Dobbins and Oregon House are threatened. Evacuations are in effect. SHU Lightning (Shasta-Trinity Unit, Cal Fire): 17,623 acres at 70 percent contained. This fire is located three miles northeast of Burney. La Brea (Los Padres National Forest): 69,131 acres at 10 percent contained. This fire is one mile east of Santa Maria. Structures are threatened and evacuations are in effect. Coffin (Shasta-Trinity Unit, Cal Fire): 1,200 acres at 75 percent contained. This fire is one mile northwest of Lewiston. Reduction in acreage is due to more accurate mapping. Information: Call 530-225-2510 or visit the incident website. Summit (Mendocino National Forest): This fire was contained at 350 acres. Narraguinnep (San Juan National Forest): 6,779 acres at 80 percent contained. This incident is 12 miles southeast of Dove Creek. Rain fell over the fire yesterday. Horse Butte (Cassia County Fire Department): This fire was contained at 340 acres. Williams Creek (Umpqua National Forest): 8,389 acres at 88 percent contained. This fire is 15 miles east of Glide. Residences remain threatened and roads in the area are closed. Information: Visit the incident website. Cougar Ridge Complex (Wallowa-Whitman National Forest): 222 acres at 90 percent contained. This complex is 12 miles south of Wallowa. No new information was provided. This will be the last report unless new information is received. 2009 Summer Wildfire Response (Texas Forest Service): 8,752 acres at zero percent contained. These fires are located throughout the state. Reported acreage is a cumulative total. Big Pole (Salt Lake Field Office, Bureau of Land Management): 43,923 acres at 75 percent contained. This fire is 12 miles west of Grantsville. No new information was provided. NEW White Valley (Bear River Area, Utah Department of Forestry): 2,400 acres at 40 percent contained. This fire is nine miles north of Brothwell. Moderate fire activity was reported. NEW Discovery (Southeast Area, Washington Department of Natural Resources): 4,279 acres at 95 percent contained. This fire is seven miles southeast of Moxee City. On August 12, 2009, the Lockheed Fire broke out in the mountains southwest of San Jose, California, and burned through an estimated 2,600 acres of brush and timber by the morning of August 14. The fire was burning about 4 miles northwest of the town of Boulder Creek, and at least 2,000 people had been forced to evacuate their homes. This photo-like image of the fire was captured by the Moderate Resolution Imaging Spectroradiometer (MODIS) on NASA’s Aqua satellite on August 13. The red outlines mark the location where the sensor detected active fire. A narrow but dense plume of smoke slices across the mouth of Monterey Bay, stretching past the city of Santa Cruz toward Monterey. The landscape of this part of California is one of redwoods and fir trees, and it appears lushly green in this image. But mixed with these forests are tracts of chaparral (landscapes dominated by fire-adapted, drought-tolerant shrubs and grasses) and large stands of highly flammable knobcone pine. Hot, fast-moving fires are a natural part of this landscape, and people’s desire to suppress forest fires around their homes in recent decades has allowed some areas to become unnaturally overgrown—and primed for wildfire. Bookwalter, G. (2009, August 14). 2004 Cal Fire report called area near Lockheed county’s worst fire hazard. Mercurynews.com. Accessed August 14, 2009. National Interagency Fire Center. (2009, August 14). Incident Management Situation Report, Friday, August 14, 2009–0530 MDT. NASA image courtesy Jeff Schmaltz, MODIS Rapid Response Team. Caption by Rebecca Lindsey. DAVENPORT, Calif. — Hundreds of firefighters are battling a wildfire that has forced about 2,400 people in the Santa Cruz Mountains to evacuate their homes. Authorities issued a mandatory evacuation order Thursday morning for the entire population of Bonny Doon. The community of about 2,000 residents is located roughly eight miles north of Santa Cruz. Everyone in the nearby community of Swanton has also been ordered to leave. About 400 people live there. State fire officials say the blaze started shortly after 7 p.m. Wednesday. It has grown to about 2,300 acres, or 3.6 square miles, and is at zero containment. Further down the coast, officials say a 46-square-mile blaze on the edge of the Los Padres National Forest in northern Santa Barbara County is about 10 percent contained. Bonny Doon residents watch as smoke billows over a field in Santa Cruz County. PHOTO: AP. image may be subject to copyright. A wildfire has burned more than 50 square miles of land near Santa Barbara. KPCC’s Molly Peterson reports that the La Brea fire has closed part of a national forest and forced people to evacuate their homes. Thousands of firefighters, including crews from Orange County, are working in the San Rafael Wilderness. Brushy canyon in that area has been burning for almost a week. Los Padres National Forest managers have closed more than 100 square miles of nearby lands, and fire officials on Tuesday asked residents of two dozen ranches and homes to leave. Now they’re asking people in 150 homes along the western edge of Los Padres, toward Santa Maria, to do the same. Fire crews are working to control the northern edges of the fire, near the homes. The northeast area of the fire hasn’t burned in 87 years. New Cuyama High School is a temporary emergency shelter for people. Ranchers who own horses and cattle are moving large animals too – some of them to Santa Maria Fair Park. It’s night and day compared to a similar lightning storm on June 20, 2008. Same number of lightning strikes, but 10 times as many fires because the forest was drier and the storms brought little moisture. Recent lightning is coming with much more precipitation and the fuels are not quite ready to burn actively. Thirty-three hours of lightning in Northern California on June 20 produced more than 5,100 lightning strikes, igniting 1,000 fires in the area, according to the US Forest Service. The mother saved her 10-year-old daughter, who was taken to Arrowhead Regional Medical Center in critical condition. The girl suffered burns and smoke inhalation. In the past week, thunderstorm activity produced over 5,000 lightning strikes in Northern California resulting in nearly 90 fires in the northern region. “On Sunday alone, roughly 1200 lightning strikes occurred in the area,” according to Basil Newmerzhycky, a Forest Service meteorologist in Redding. Fire crews quickly responded to the lightning-caused blazes, holding the total acres burned for all the fires to less than 45 acres. The Oregon Department of Forestry says more than 20 lightning sparked fires were reported on both Bureau of Land Management and private lands over the weekend, including three on Monday. How could anything be deadlier than Fire? Image may be subject to copyright. MAY 14 11:50AM EFFECTIVE IMMEDIATELY ALL EVACUATION WARNINGS HAVE BEEN LIFTED. AS PREVIOUSLY COMMUNICATED, THERE ARE CURRENTLY NO MANDATORY EVACUATION ORDERS IN EFFECT. THANK YOU ALL FOR YOUR CONTINUED COOPERATION AND PATIENCE. The Jesusita wildfire in Santa Barbara is 90% contained, however the remaining portion which is burning along a ridge in the coastal mountains is proving difficult for firefighters to reach and extinguish, the news media reported a fire official as saying. “Right now, it’s pretty steep. The last 10% is the most difficult part to put out and we’ve been working on it the longest.” said Fire Capt. David Sadecki. Meanwhile the Santa Barbara Fire Department set a containment date for May 20, postponing the date set initially by exactly 7 days. FEWW will try and tackle some of the unanswered questions in the future entries. The Humorous side of Calif Wildfires. Santa Barbara, May 7, 2009. A house lies in ruins consumed by Jesusita fire which was fueled by strong sundowner winds and record 100-degree heat. Photo: Getty Images [inset added.] Original image and inset may be subject to copyright. Damage assessment teams have been working in the field providing more accurate survey numbers. Assessment to date: 80 homes destroyed, 15 homes damaged; 79 outbuildings destroyed; 2 outbuildings damaged; 1 commercial property destroyed. Be Like a Bear. Don’t let the fire scare the Jesusita out of you! 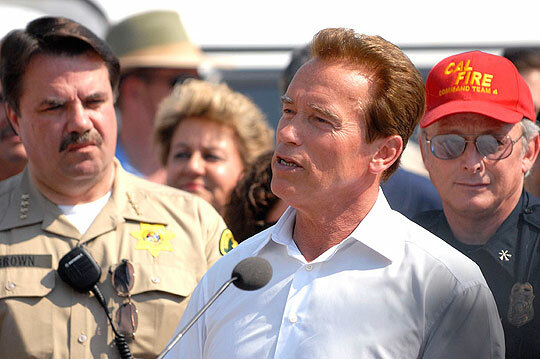 The-State-of-Emergency Governor Arnold Schwarzenegger at a fire emergency news conference. Undated photo published on May 7, 2009. (Lara Cooper/Noozhawk photo) Image may be subject to copyright. The Jesusita fire, Santa Barbara County, May 10, 2009. A charred view from La Vista Road shows a residence that was spared as thousands of residents made their way back to their homes on Sunday. Photo: (Anne Cusack/Los Angeles Times). Image may be subject to copyright. The authorities first said they suspected arson. But when we raised the question Cui bono [other than the fire industry,] they changed their story. All previous evacuation warnings are now lifted. 3. watch the cost estimate go through the roof by the time the fire is put out. The Jesusita Wildfire, Santa Barbara, Calif. Smoke from smoldering hot spots rises in the hills above Highway 154 on Saturday, May 9, 2009, in Santa Barbara, Calif. (AP Photo/Eric Parsons). Image may be subject to copyright. Molten aluminum has flowed from the wheels of a burned-out car, in front of a home destroyed after the Jesusita fire swept through Santa Barbara, Calif., Thursday, May 7, 2009. (AP Photo/Reed Saxon). Image may be subject to copyright. Santa Barbara County firefighters spray water on the rubble of a house that burned during the Jesusita fire in Santa Barbara, California May 7, 2009. REUTERS/Mario Anzuoni Image may be subject to copyright. About half of the 30,000+ people evacuated from the area affected by the Jesusita fire in Santa Barbara, California, were allowed back earlier today, the fifth day since the fire started, as firefighters made progress against the wildfire. The other nearly 15,000 people remained under mandatory evacuation as of this afternoon, according to Harry Hagen, an official at the Santa Barbara County emergency ops. About 30 percent of the fire had been contained, Hagen reported. The fire should be contained by Wednesday, officials said. More than 4,200 firefighters using nearly 500 fire engines, and a total of 25 air tankers, helicopters and a converted DC 10 were employed. No reports of civilian casualties, but 13 firefighters were injured, with three of them needing hospitalization for smoke inhalation, and burn. Based on last years patterns, the next fire (s) could erupt withing the next 18 days. Jesusita Fire, Santa Barbara Hills, California. NASA image (acquired and released – drum roll – May 8, 2009). Created by Jesse Allen, using data provided courtesy of the MODIS Rapid Response team. Estimates of burnt acrage vary from 4,000 to 9,000 acres. With 450 or so engines, 14 air tankers, 15 helicopters and CalFire’s converted DC-10. The blaze is about 10 percent contained. Thanks to the sheer no of evacuees, hotels in the surrounding areas are doing brisk business. Image of the Day: Oh NO, Not More of those Dreadful, Expensive, Orange Chemicals! Massive volumes of fire retardant are dropped on the Jesusita fire in the San Marcos Pass near Santa Barbara. May 8, 2009. Photo: Bryan Chan/Los Angeles Times. The Jesusita fire raged with renewed ferocity on day fourth. The blaze has scorched an estimated 4,000 acres. The fire has advanced on the city and two nearby communities. In addition to the 30,000 residents who have already fled their homes, about 25,000 others were told to be ready to evacuate at a moment’s notice. “Literally, last night, all hell broke loose. … We saw the fire spread laterally across the top of the city and the fire front extend to almost 5 miles now.” City Fire Chief Andrew DiMizio said. No civilian damage, bu 11 firefighters have been hurt, 3 of them hospitalized with serious burns. Map of Evacuation and Warning Area. Image may be subject to copyright. Image of the Day: California Bear on its back! California Bear on its back! Wind-driven blaze in Santa Barbara. Dense smoke drifts over Santa Barbara as sundowner winds stoke the Jesusita fire. May 7, 2009. Photo: Luis Sinco/Los Angeles Times. Image may be subject to copyright. The fire has blackened at least 3,000 acres. Up to 80 homes and structures have so far been destroyed or damaged by the blaze. Gov. Schwarzenegger, who earlier declared a state of emergency in Santa Barbara county was heard as saying that the fire is proving extremely difficult to bring under control. Earlier this morning (local time) fire made a significant jump aided by the “sundowner” winds. The fire threatens the town of Santa Barbara. More than 30,000 people were under evacuation orders this morning. About 2,350 firefighters are tackling the blaze, aided by 250 engines, 10 air tankers and 15 helicopters. Image of the Day: The World Should Be Orange! One day all babies in Calif. will be born orange! The Jesusita fire, Santa Barbara County, Calif. May 6, 2009. Photo: Mark Boster/Los Angeles Times). Image may be subject to copyright. The Jesusita fire has already consumed about 1,500 acres. The fire may scorch up to 2,500 acres. As many as 44 structure may have been destroyed. Another 3,500 homes are still threatened, according to the officials. “The Jesusita fire has been a great challenge, there’s no two ways about it,” said the Bard of Brentwood [aka Gov. Arnold Schwarzenegger] at a news conference in Santa Barbara. Most of the people living in the foothills of Santa Barbara have been evacuated, as up to 1,400 fire personnel tackle the blaze, said Capt. Mike Deponce of the SBCFD. A high-wind warning for the Santa Barbara coastal area (including Montecito, Carpinteria and San Marcos Pass) issued by the National Weather Service forecasts sporadic winds of 40 to 65 mph with gusts of up to 65 mph through Friday. The dense brush that covers the area that had not cleared for fifty years, waiting to fuel a major fire. How did this house catch fire? A home burns in the foothills near Santa Barbara. May 7, 2009. Photo: Luis Sinco/Los Angeles Times. Image may be subject to copyright. The Jesusita fire is the Santa Barbara’s third major wildfire in under nine months. Santa Barbara County Sheriff’s Department said 5,430 homes were under mandatory evacuation. An estimated 30 homes may have been incinerated. Nearly 14,000 people have left their homes. “We are having very extreme weather … The fire is moving from the north to the south and it’s moving into the neighborhoods.” Santa Barbara Fire Captain David Sadecki said. A house burns and others are threatened as the Jesusita wildfire, fueled by high winds and record temperatures, moves through the hills of Santa Barbara, California May 6, 2009. About 30 homes destroyed and 2,000 evacuated on the outskirts of Santa Barbara on Wednesday as a fierce, wind-whipped wildfire raged in rugged foothills above the central California seaside city. REUTERS/Jason Redmond. Image may be subject to copyright. A 5-million dollar home with a perfect view. Who shut off the sprinkler system? Photo: Luis SInco/Los Angeles Times. Image may be subject to copyright. The Jesusita fire burns in the foothills above Santa Barbara Tuesday May 5, 2009. Southern California authorities said early Wednesday the wildfire is threatening 2,000 Santa Barbara homes and has grown to 400 acres. Santa Barbara County spokeswoman Pat Wheatley says the fire has pulled within a half-mile of some neighborhoods. The fire began Tuesday afternoon in the foothills above San Roque Canyon and quickly grew. (AP Photo/Keith Cullom). Image may be subject to copyright. “Elsewhere, a fire in rural southeastern Arizona had destroyed three houses near Sierra Vista and injured one person. The fire had charred about 1,500 acres near Fort Huachuca. Containment was estimated at 25 percent early Wednesday.” AP reported. SANTA BARBARA, Calif. — Some 1,200 homes have been ordered to evacuate amid threat of a wind-driven wildfire burning in Santa Barbara County. A helicopter makes a drop [in the ocean] on a fire near Santa Barbara, Calif. Photo: AP. Image may be subject to copyright. The blaze reportedly erupted Tuesday afternoon and is burning about a square mile of brushlands on the foothills of Santa Barbara. The residents are being told that the winds are forcing the fire toward their homes. “Evacuations have been ordered for neighborhoods spanning an area about 2 1/2 miles wide, and part of State Route 192 has been closed.” AP reported. Meanwhile, ABC News reported that $81 million would be slashed from Cal-Fire’s budget, eliminating more than 600 full-time and 1,100 seasonal firefighting positions,” commenting that no doubt it will slow response time. “I don’t like to use scare tactics or anything like this, but fire protection, without any doubt, will suffer if those measures fail on May 19th,” Schwarzennegger said. As for the irresponsible people who are allowed by the criminally negligent authorities to live in or at the age of forestland, it’s high time they came to their senses and stopped destroying our ailing national treasures. Devil knows why any responsible state would allow its voters to live in a national forest! It’s really great when people help each other. So to me this site has helped me find the necessary information. I did subscribe for email updates.